London: One of UK’s leading umbrella groups for Hindus has said the Bank of England has assured them that concerns over the use of animal fat in the new five-pound notes were being treated with “utmost seriousness” and the new 20 pound notes would be launched only after consultations. Hindu Council UK held a number of meetings with the central bank’s representatives to explain that as Hindus see the cow as a symbol of grace and veneration, the use of tallow made from beef fat in the notes went against their beliefs. “Over the last couple of months, the Hindu Council UK has been in communication with the Bank of England (BoE) and raised the concerns of the Hindu Community, Hindu Temples and Hindu Organisations in the UK. “The Bank of England assured that they were treating those concerns with the utmost seriousness and wanted to understand better what impact the use of small traces of animal-derived products in polymer banknotes may have within the community before making any further statement on the issue,” Hindu Council UK said in a statement this week. The BoE had announced recently that it would not be withdrawing the polymer notes and that new 10-pound notes made of the same material would also go ahead for their launch later this year. However, it would launch a consultation before issuing similar new 20-pound notes. “The Hindu Council UK is pleased that the Bank of England has listened to our concerns and halted the issuing of the new 20 pound notes until a full consultation has been done. In addition, the Bank of England has assured us that they are working with polymer suppliers to investigate alternatives, including some that are plant-based, for the future,” the council said. In late November 2016, BoE announced that it had been informed that small traces of animal-derived products were used by a supplier in the manufacture of the new polymer 5 pound notes. Tallow is a hard, fatty substance made from rendered animal fat. It is commonly used to make soap and candle. The new polymer note uses beef tallow made from suet, which is hard fat found around the animal’s kidneys, stomach and other organs. The new 5 pound notes, and the future 10-pound notes, contain animal fat in the form of tallow which sparked protests among millions of vegans, vegetarians, Hindus, Sikhs, Jains and others in the UK. The Hindu Council UK representatives had highlighted that many Hindus were concerned due to the animal-derived products in the new notes, because one of the key virtues in the Hindu faith is Ahimsa or the practice of non-violence. 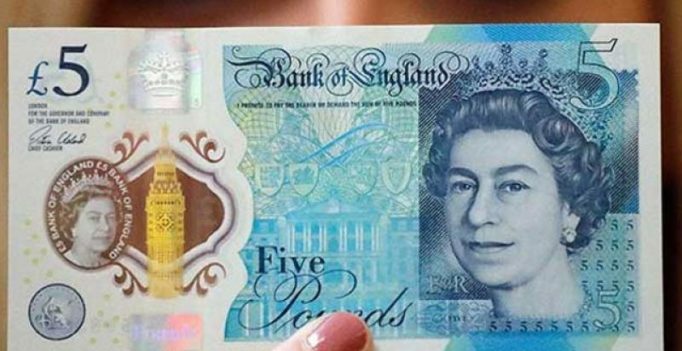 It had received many calls from various Temples across the UK who had banned the use of the new five-pound note as donations to deities within the sanctuary of the temple environment. “As a consequence of not allowing the five-pound notes in the Temple environment, many of the temples had seen a huge decrease in their Temple economy, which relies totally on donations in order to operate,” the council said. “Weighing the considerations, the Bank has now concluded that it would be appropriate to keep the five-pound polymer note in circulation and to issue the 10-pound polymer note as planned, in September,” the BoE had said earlier this week. A petition titled ‘Remove Tallow from bank notes’ had attracted over 100,000 signatures.